Posted on November 28, 2016 November 28, 2016 by Debito Arudou Ph.D.
Hi Blog. Debito.org has talked at length about the “Great Gaijin Massacre of 1992-4,” where National and Public Universities decided to terminate en masse (at the urging of the Ministry of Education) their foreign faculty who were over 35 years old 1) as a cost-cutting measure, and 2) because they could — since most NJ were on contract employment (meaning one could be “fired” through a simple contract non-renewal), while full-time J faculty were almost always employed on permanent non-contracted tenure from day one. “Academic Apartheid” is what respected scholars such as Ivan Hall called it. And conditions have not really gotten better, as (again through government design) more full-time Japanese faculty are being put on contract employment themselves, while far fewer full-time NJ are being granted permanent tenure. The fact is, employers are using the amendment as an excuse to fire their workers or change their working conditions before April 2018. When the law was enacted, it was not grandfathered to entitle those who had already worked more than five years. That meant the clock started on April Fools’ Day, 2013, and that the first time it will be possible to use this purported job-security measure will be April 1, 2018. After enactment, some employers put new hires on one-year contracts with a three-renewal limit, or a five-year maximum with no renewal possible afterwards. It seems obvious this was to avoid being restricted by the five-year rule, which is really a “more-than-five-year rule.” Other employers are planning to either change their employees’ working conditions or fire or nonrenew their employees over the coming year, 2017. Again, it seems obvious that their intention is to avoid the new law and thereby violate its job-security spirit. And this month I’ll name names — or a name in this case. This month’s installment delves into the “Tohoku University massacre.” This prestigious, famous and respected college with a long history and tradition has revealed that it plans not to renew the fixed-term contracts of up to 3,200 employees when they next come up for renewal. This kind of move — effectively a mass firing — is rare in Japan, and the plan has already had a huge impact in education and labor-law circles. I am XY, a long year NJ resident. First I want to thank you for the great work you do to enhance human rights in Japan. I learned most of the discrepancies between law and practice (especially Hotels *cough*) from your blog. Great work. Debito.org has focused on the GOJ’s biased surveys regarding human rights and NJ in the past, and found the science to be very bad. This poor science has even been found in surveys of NJ residents at the national (here, here, and here) and local levels (Tokyo and Urayasu, for example). 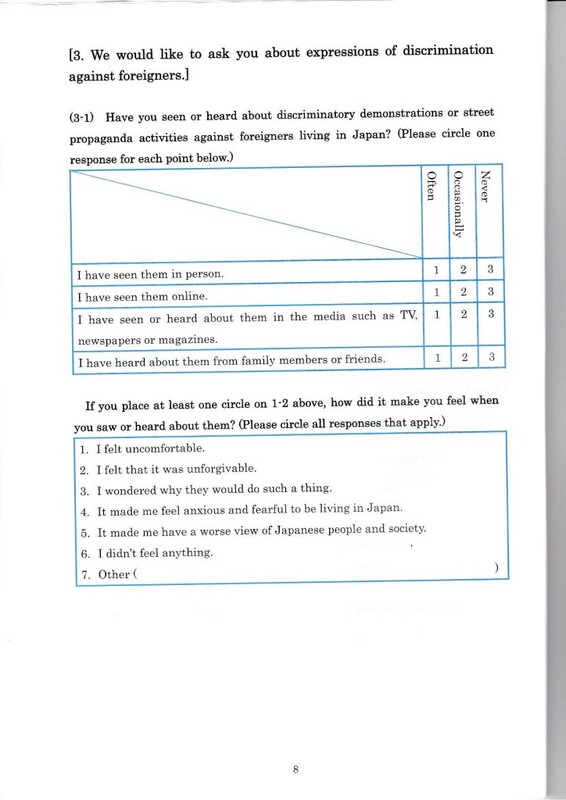 It’s amazing how quickly common human decency and equal treatment evaporates from Japan’s social science just as soon as “foreigners” are brought into the equation. 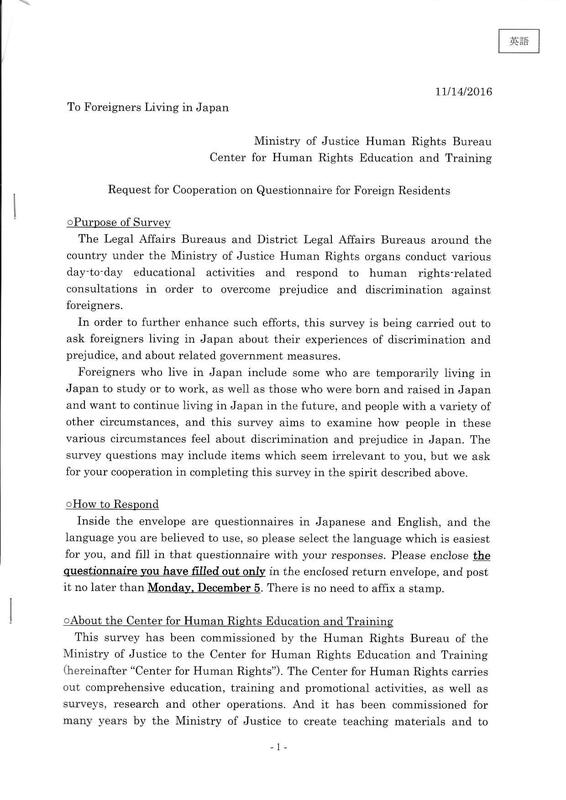 So that’s why I approached these new surveys for “Foreigners Living in Japan” (as opposed to “Non-Citizen Residents of Japan”) from the Ministry of Justice Human of Human Rights (BOHR), Center for Human Rights Education and Training, with some trepidation. Especially given the BOHR’s longstanding record of unhelpfulness and abdication of responsibility (see also book “Embedded Racism“, pp. 224-231). But let’s take a look at it and assess. Here is a sampling of pages from the English version in jpg format (the full text in Japanese and English is at the above pdf links). Skipping down to the next section, we see that they get to the discrimination issues (housing first, and that’s a major one) pretty systematically, and with the possibility of open-ended answers. Good. And then we get to a decent list of miscellany. 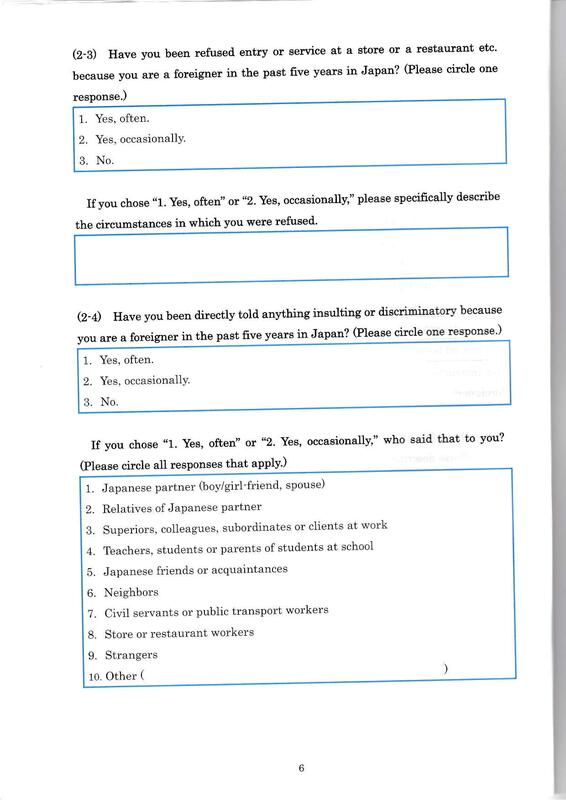 Note that there is no mention of any discrimination by officialdom, such as police harassment, racial profiling, or Gaijin Card Instant Checkpoints on the street or in hotels. (Naturally: The BOHR is part of the Ministry of Justice, as are the Japanese police forces — and their bunker mentalities are but an inevitable part of managing Japan’s security and erstwhile “world’s safest society” against outside threats). According to this list, discrimination only seems to happen because of nasty “Japanese people” as individuals, not because of something more systemic and embedded, such as Japan’s laws, enforcement of laws, or judiciary. Then we get to the subject of what to do about it. 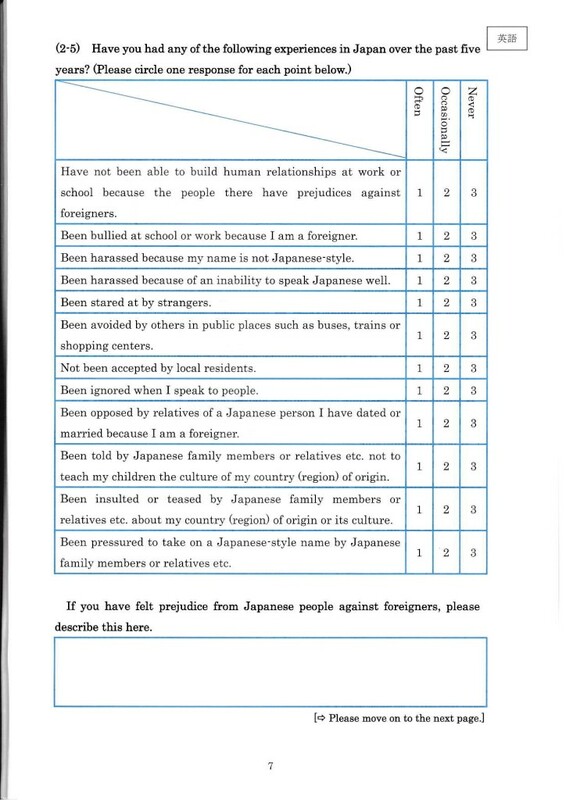 The survey starts off with the typical boilerplate about “cultural differences” (the regular way of blaming foreigners for “being different”, thereby deserving differential treatment), but then by item 6 we get a mention of a law against preventing “discrimination against foreigners” (as opposed to racial discrimination, which is what it is). So at least a legislative solution is mentioned as an option. Good. Posted on November 16, 2016 November 16, 2016 by Debito Arudou Ph.D. The morning after the election, I woke up to Trump’s America. I’d had a fitful sleep the night before. I’d watched the results from Hawaii, one of America’s bluest states, where our friend had organized a house party to ring in the predicted victory of Hillary Clinton and the continuation of local hero Barack Obama’s legacy. The first polls on America’s East Coast would be closing in our early afternoon. We’d see a clear outcome by dusk and go home happy. But we lost our swing as the sun went down. Donald Trump started with an early lead thanks to some victories in the Bible Belt and Great Plains. But OK — they almost always go Republican. And, not to worry, the Northeast states mostly went blue. As soon as a few of the “battleground” states turned our color, as polls predicted they would, Clinton would leapfrog to victory. But then more southern states started going red. Alabama, Mississippi, Louisiana — sure, lost causes to begin with, right? Wyoming, Montana, Idaho — so deep red that the networks called them right after their polls closed. But then Ohio fell. And Florida. And Georgia. I remember our cheers when Virginia went blue, then our shrieks when North Carolina canceled that out. Then the nor’easter: Maine and New Hampshire became too close to call. Even when the West Coast states came in and put Clinton in the lead, that too began to erode. After California, the Democrats had nothing left in the tank. At that point the TV networks began to doomsay. MSNBC’s polling geek spent more than a television hour on incoming votes from rural and urban counties in Pennsylvania, Michigan and Wisconsin. The dominoes were falling the other way. And then, stunningly, Trump’s victory in the “rigged” (Trump’s word) Electoral College became a mathematical certainty. By the time the cameras turned to Clinton’s victory bash and showed delegates slinking out, I had too. Back home, I watched as Clinton conceded even before all the networks had called it for Trump. I felt betrayed. And insomniac. 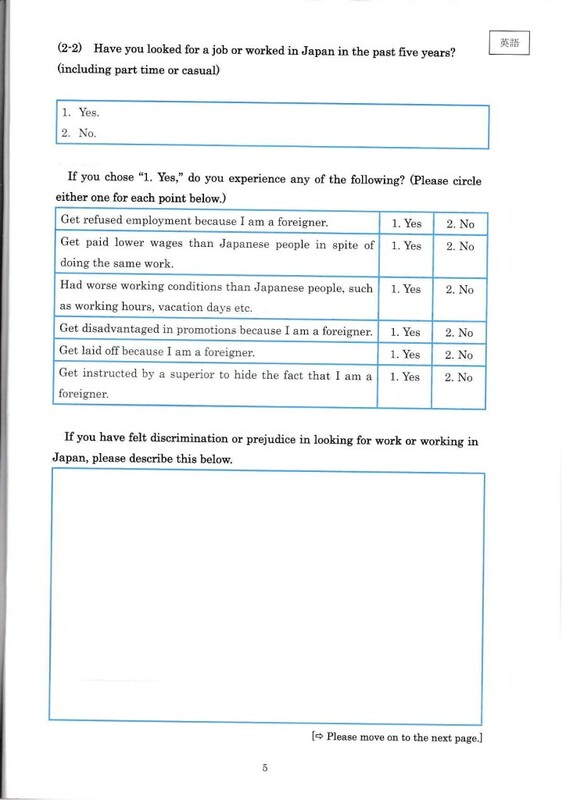 My name is Shiki, and I’m a long term resident in Japan, having been living for almost 9 years now, and I’m actually in the process of naturalization. I wanted to report about the most horrible experience I’ve had in Japan, which happened on October 25, 2016, at a Hotel called “Sakura Hotel Jimbocho“. I live in Sapporo, and a few weeks ago I was told by my boss that they needed me to go Tokyo in less than a week from that date. I reserved my air ticket, and looked for hotels near where is the Tokyo office of my company. I looked at many capsule hotels, but since I needed to finish some work before the next day I preferred to get a single room so that I could work in my Notebook, but the problem was that all hotels around that area where more expensive that what the company was willing to cover for my stay. Then I remembered that near that place, I saw once this “Sakura Hotel”, which even thou I never used any of “Sakura” services, I knew it they offered guest houses and weekly mansions mainly targeted to foreigners, so I just went to their site to see what that place was about, and it appeared to be a normal hotel, mainly targeted to tourists, but they were also offering it as a cheap business hotel for Japanese people. So I took a look at the prices, and it was perfect. It was a small room, with free wifi, and so close to the office that I could actually just walk to it, and I could arrive late at night to check in (which I needed to), so with no second thoughts I just reserved it. And this was the time I saw the first red flag of what was about to come. In the registration they asked for my nationality, which is something I’ve never been asked before. 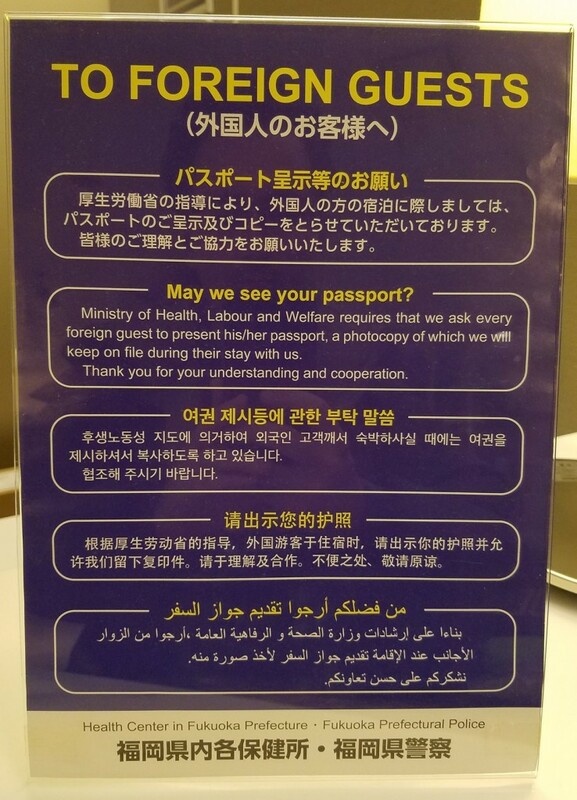 And it said that “Foreigners were required to show their passports”, so I looked at this, and saw your posts about the subject, and then I just thought “Thet are just doing this for the tourists”, so I just left the default that was “Japanese” in nationality. I arrived at the hotel past 11pm, and went to the lobby and it was the usual check-in, until the guy asked me for my passport, to what I just said “I’m not a tourist”, then this guy asked me if I was Japanese, and I told him that no but that I was not a tourist and didn’t even had my passport with me. 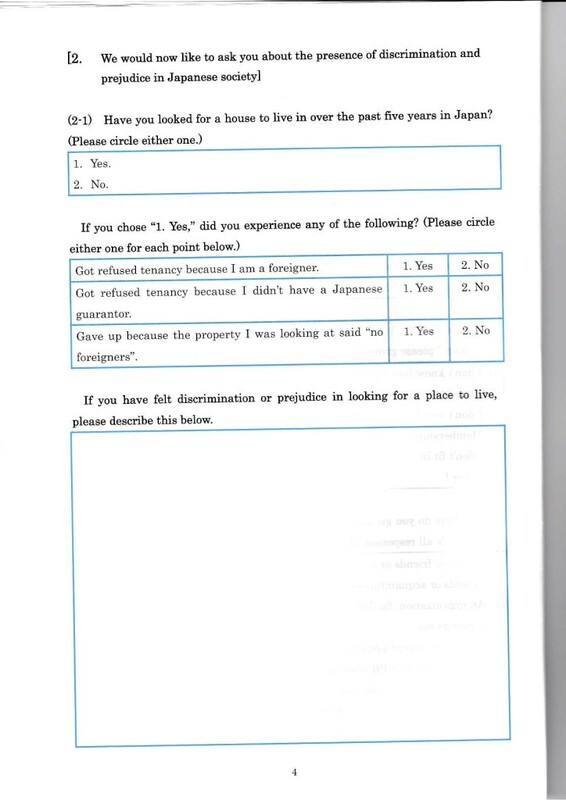 At that moment I was not sure if it was even legal for them to refuse me service, so I insisted that the whole thing of the passport is supposed to be targeted at tourists who do not have a residence in Japan, and that since I had an actual address in Japan that rule did not apply to me. Then this guy proceeded to say that it was “hotel policy”, and that if I didn’t wanted to comply with “hotel policy” I was free to search for another hotel. It was late at night, I’ve searched mant cheap hotels on internet and I knew all of them were full, my phone battery died, so i couldn’t even search anything, so really I was forced to give him my card, which he took a copy witbout my permission, and asked him to destroy the copy, thing he refused to do, and threatened me to “return me my money” if I continued “causing trouble”. So I got to my room and immediately searched for my legal standing on this matter, and this us when I knew that they cannot refuse me service, so I went down with a copy of the law, and told the guy on the lobby to read it. He took a look at it, and then told him that it was actually illegal for him to refuse me service, and that I wanted them to destroy the copy of my residence card or that I would sue them. The first response of this guy was “you are free to do whatever you want”, and then I proceeded to ask for his name, and told him I was going to contact management of the company and tell them what he just said. 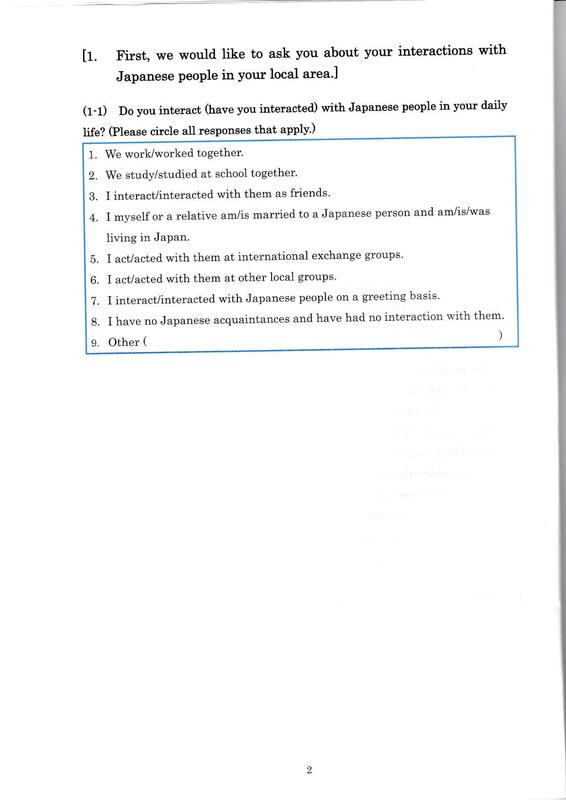 The he proceeded to make excuses that he dodn’t knew about the law, that he has to report foreigners to the police, and almost telling me that he was gping to “get scolded” by the police if they saw my name without any ID. I told him it wasn’t my problem, and that he just needed to show the police that I have an address in Japan. He told me that police was going to scold him for not giving the ID of a foreigner, and when I asked him how would they even know if I’m a foreigner and not of Japanese nationality, he proceeded to make a racist statement about how “He can tell by their face, or their accent”. I told him that was racist and he proceeded to once again threaten me about “returning me my money” even after was I told him. So I returned to my room, and wrote a mail of what just happened to the management of the hotel. The next day when I was about to check out, this new guy told me he was in charge of the hotel and that he saw my mail. He apologized for how the guy last night handled the situation, and then he started to explain me that they have many foreign customers, and because of this they are tightly under the watch of the police, and that ws tbe reaspn for their policy. 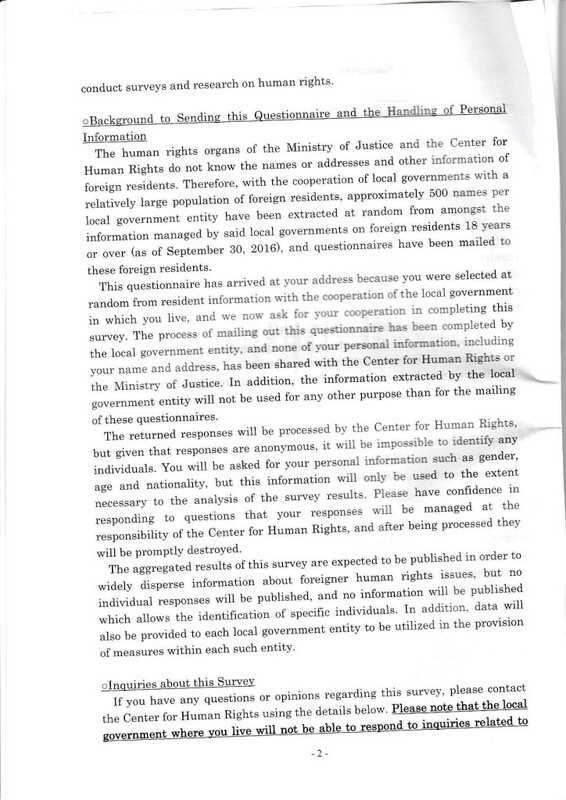 I told him that his policy is illegal, since the residence card is contains sensitive information and that they cannot ask and then try to refuse service if I don’t comply. He told me that they need some kind of identification, and I told them that I was more than happy to give them my identification, but just not my residence card. He continued trying to justify himself, at one point he even started out of nowhere to speak in broken Spanish (he probably saw in the residence card info I refused to give that I was from a Spanish speaking country, which made me more mad than anything, specially when I was talking with him in Japanese without any problem), and I was running late, so I just told him that I have never been asked by a hotel to provide any extra information outside of my name and address, and he told me that they “may” change their policy. I’m really considering taking legal action against this company, and I hope this helps to expose this company to their foreign customers, so that next time they want to use their services they are aware that they are a company that racially profiles people and ask them illegally based on this to provide personal information under the illegal threat of refusal of service. The Justice Ministry will conduct its first large-scale survey on racism in Japan as discrimination becomes a growing social concern, a report said Sunday. The survey will cover 18,500 foreign residents 18 or older, the Asahi Shimbun newspaper said, adding that the results will be released by the end of March and reflected in new policies. The poll will be conducted in 13 languages ranging from Japanese and English to Chinese, Korean, Vietnamese and Portuguese, the vernacular daily said. 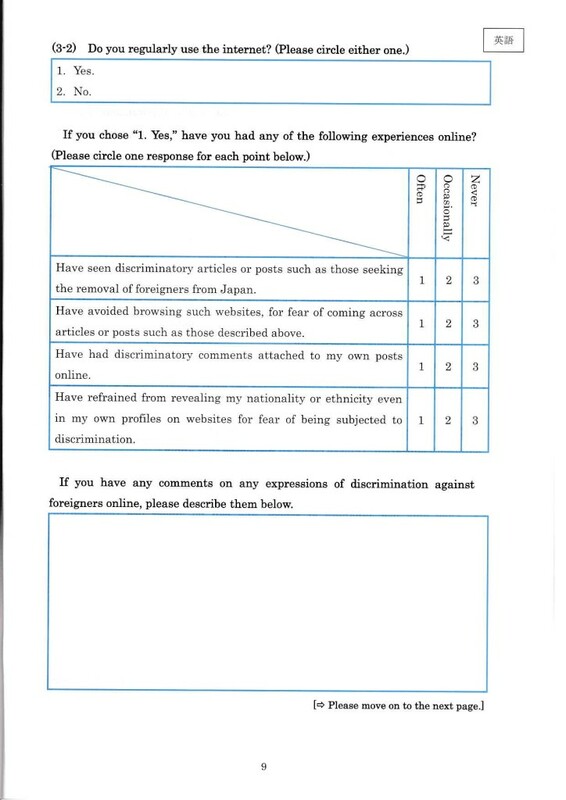 The questions will ask whether respondents have experienced or seen racial discrimination in daily life or in the workplace, and what action they want the government to take to eliminate it, the report said. The number of foreign residents has grown in recent years, but their ratio to the total population still stands at less than 2 percent, according to ministry data. No comment on the report was available from the ministry Sunday. Incidents of hate speech directed against specific ethnic groups on the streets or online have broken out in recent years. Most are directed at ethnic Koreans who ended up in Japan when the Korean Peninsula was under Japanese colonial rule between 1910 and 1945, and their offspring. In a rare court ruling against racial discrimination, a vocal anti-Korean group was ordered in 2013 to stop its hate speech campaign against a Pyongyang-linked school and pay some ¥12 million in damages. The Diet in June brought in legislation promoting efforts to eliminate discriminatory speech and behavior against non-Japanese people.